Lawrence of Arabia: Hollywood fact or fiction? 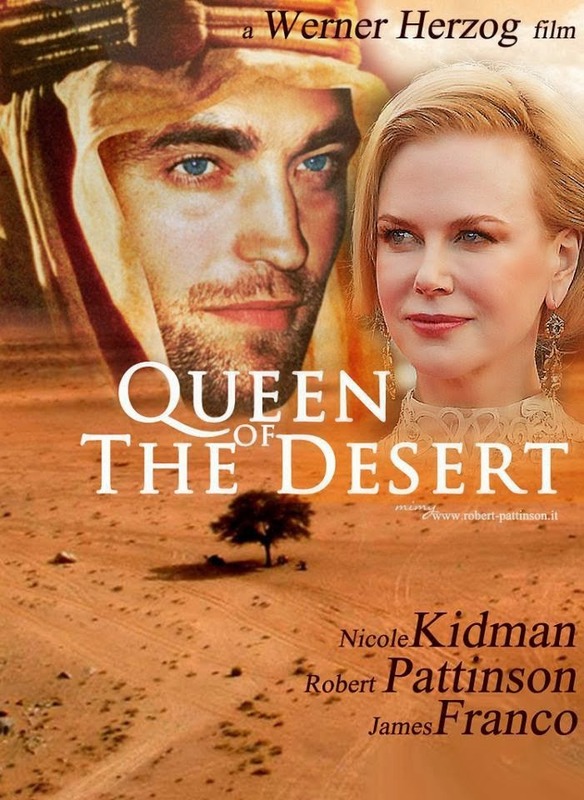 NICOLE KIDMAN (well, that’s got the chaps’ attention) is about to appear in the starring role of a new film about Gertrude Bell called ‘Queen of the Desert’ (not to be confused with ‘Priscilla …’). Gertrude (certainly not Priscilla) was an archaeologist and heavily into the first World War Arab Revolt and in restoring Iraq to self-rule. A task the archaeologist, T.E. Lawrence, attempted to do after the First World War. In fact, Lawrence wanted all of Arabia restored to the Arabs – it had been taken over by the Turks (Ottoman Empire) some 500 years before. 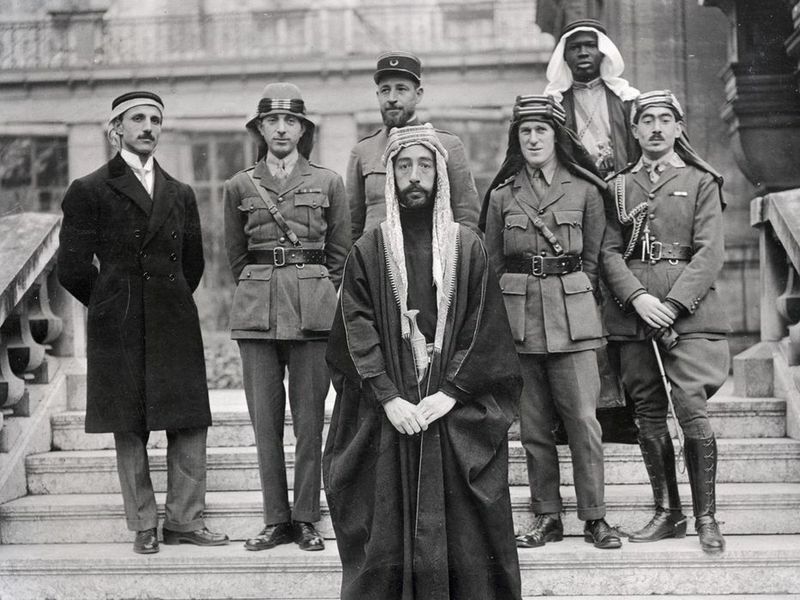 In 1915 the British Government promised Sherif Hussein of Mecca an independent Arabian State if he revolted against the Turks and help win the war. 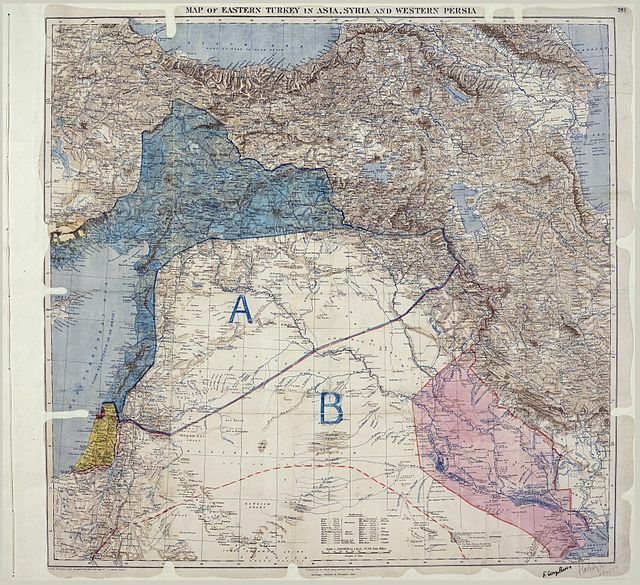 However, the following year the British Government then entered into the secret, and rather presumptuous, Sykes-Picot Agreement with France, wherein Syria and part of Arabia would be divided up between the two once the Turks had been defeated. Nobody bothered to tell the Arabs about this. 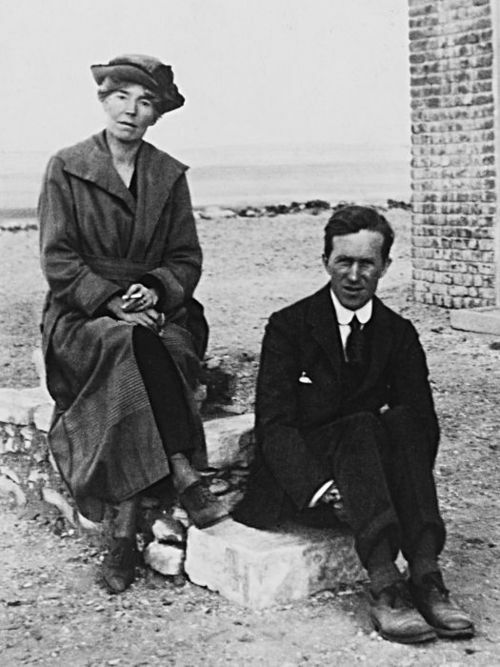 What’s Gertrude Bell got to do with Lawrence of Arabia I hear you mutter. Not much, other than I’ve been reading Bell’s biography, Daughter of the Desert, by Georgina Howell , who said that “Lawrence agonized, faltered, and final abandoned the Arab issue and tried to escape from his own tortured personality, to reappear in the nondescript persona of one Aircraftsman [sic] Shaw”. Rather harsh, and untrue. ‘Harsh’ because of what Lawrence had been through for around two years in Arabia (1916-18) and the frustrations he went through leading up to and during the Paris Peace Conference in 1919 when Syria was split between Great Britain and France – and the Arabs got nothing. 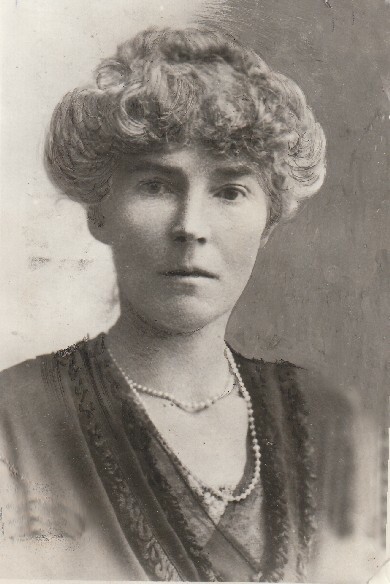 Certainly Bell was involved behind the scenes in the Arab Revolt but she hadn’t been physically battling the Turks in the desert for two years. And it certainly wasn’t Lawrence’s fault that the French kicked Feisal out of Damascus in 1920 as a result of the Paris conference and the Sykes-Picot Agreement. 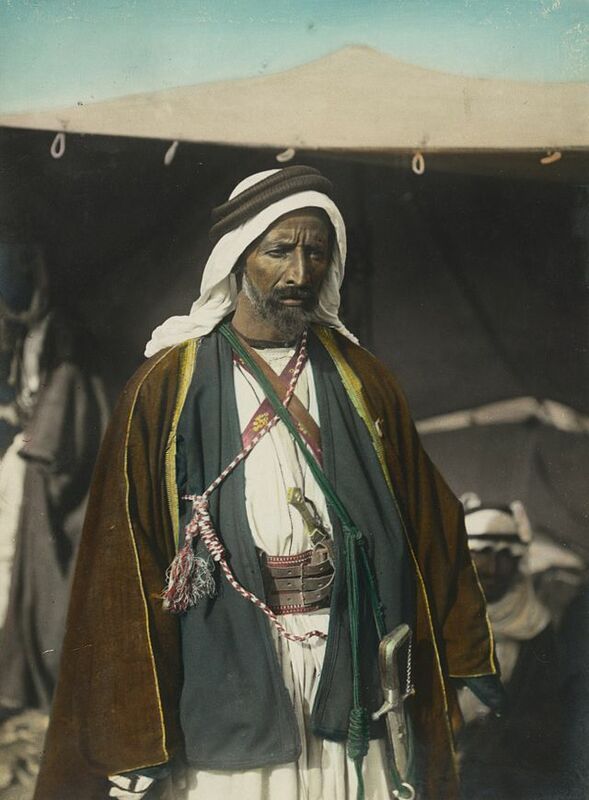 Feisal, the son of Sherif Hussein, had led the Arab revolt with Lawrence on the understanding he would be given Damascus (and title King of Syria – which he took, very briefly, before the French intervention). So, to some extent Lawrence had achieved some of his purpose but he was still pretty disillusioned about the powers that be. By now he was a Lieutenant Colonel but decided to leave the army and was given a Research Fellowship at All Souls, Oxford, to begin writing about the Arabian revolt. It was around this time that he probably had a bit of a breakdown desperately looking for obscurity. He told the writer and poet, Robert Graves, that he hoped being “ordinary in a mob of likes” would cure his mental exhaustion. He didn’t want any more responsibility (but he needed an income), so, in August 1922, to the ranks of the relatively newly formed (April 1918) RAF he went as Aircraftman John Hume Ross . However, in February 1923, he was forced, after his true identity had been discovered by the press, to change his name again to T.E. Shaw and transfer to the Tank Corps. He was later, in August 1925, able to transfer back to the RAF and became a great influence in speed boat design (for rescuing aircrew ‘downed’ in the sea). He left the service at the end of his enlistment in March 1935, only to die following an accident on his motor bike in May 1935 (although, of course, there are some conspiracy theories about that). What’s this got to with the film, I hear you mutter. 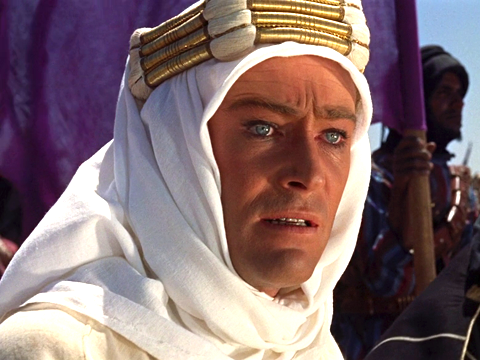 Okay, the film: I’ve also been reading Lawrence’s autobiography in Arabia, The Seven Pillars of Wisdom and it does bear some resemblance to the 1962 film. Although, T.E. Lawrence’s brother, Professor Arnold Lawrence (also an archaeologist), said he didn’t recognise his brother when he saw the film! To be fair that may have something to do with Pete O’Toole’s performance – outstanding as it was, I don’t think it much resembled Lawrence. Let’s see what Robert Pattinson (who?) does to the character in the new Gertrude Bell film. 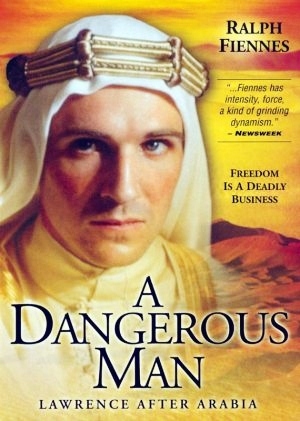 You might also want to check out Ralph Fiennes’ portrayal of Lawrence (slightly less maniacal than O’Toole’s) in ‘A Dangerous Man: Lawrence after Arabia’ made in 1990 on the Paris Peace Conference (and meet Gertrude Bell). 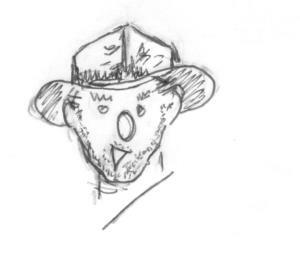 Lawrence was clearly losing it towards the end of the campaign and he was, to say the least, eccentric. But he had to be – he was, as Bell observed, “exceedingly intelligent”. He had achieved a First Class Honours degree in History at Jesus College , Oxford; began a postgrad degree at Magdalen College, Oxford, but gave it up to go to the Middle East; finally, as mentioned above, he took up as a Research Fellow at All Souls College, Oxford. He translated Homer’s Odyssey from the Greek  and The Forest Giant from French – and, of course, he was an archaeologist (must be intelligent …. or eccentric). In fact, it was as an archaeologist that he went to the Middle East rather than finish at Magdalen – and worked with the likes of Flinders Petrie, David Hogarth and Leonard Woolley. 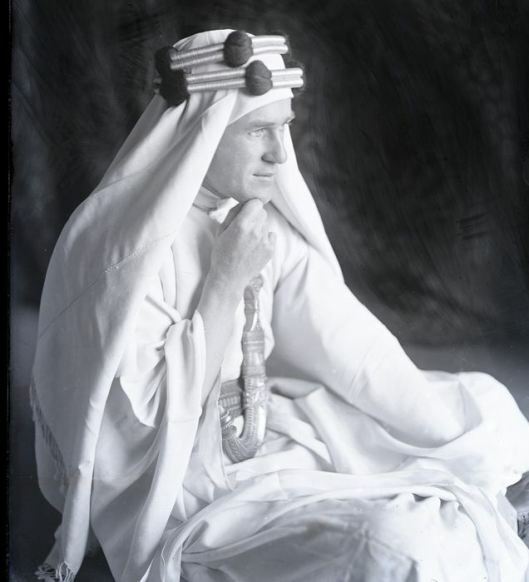 The reason Lawrence got the job at the Arab Bureau (part of Great Britain’s Foreign Office) in 1914 was because of his knowledge of both the Arabian language and the geography resulting from his archaeological work in the Middle East. 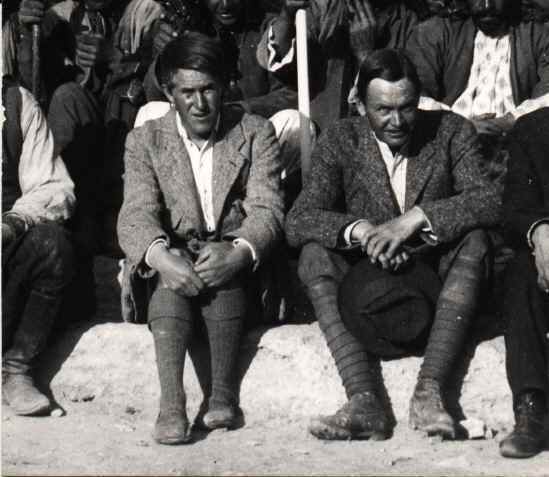 In anticipation of the war, he had already been sent out, with Woolley, through the Palestine Exploration Fund, to survey the Negev Desert as it was a strategic point for any Ottoman/Turkish advance on Egypt. So he was also a spy! 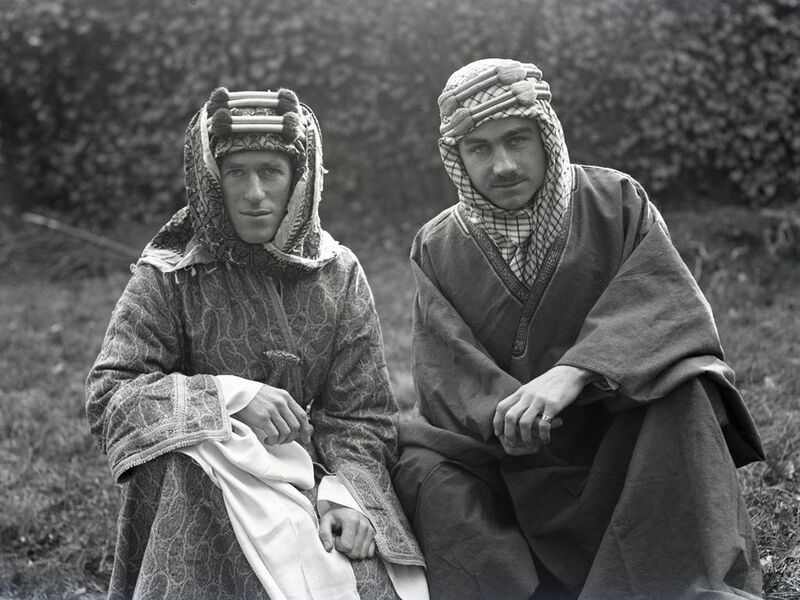 Thomas Edward Lawrence – of Arabia … a spy! Back to the film. 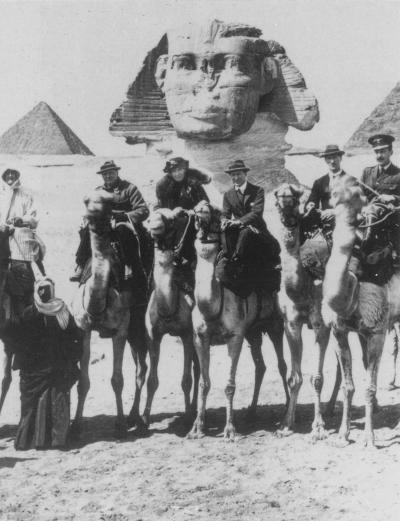 It makes no mention of Gertrude Bell’s involvement in the plans of the Arab Revolt. Hollywood obviously decided to wait on that one …… for another fifty-two years! However, it got the idea across regarding Lawrence’s activities and made him famous again. I say ‘again’ because he had already been made famous because of the American journalist, Lowell Thomas, who travelled UK and USA telling of his (Lawrence’s not Thomas’) courageous antics in Arabia. But that was between 1919-1924 – long before any of your time so you would have missed that bit. Hollywood represented Thomas as a chap called Jackson Bentley (don’t ask) who followed Lawrence throughout most of the film. In fact, Thomas only met Lawrence briefly in 1918 – but made the most of it afterwards. 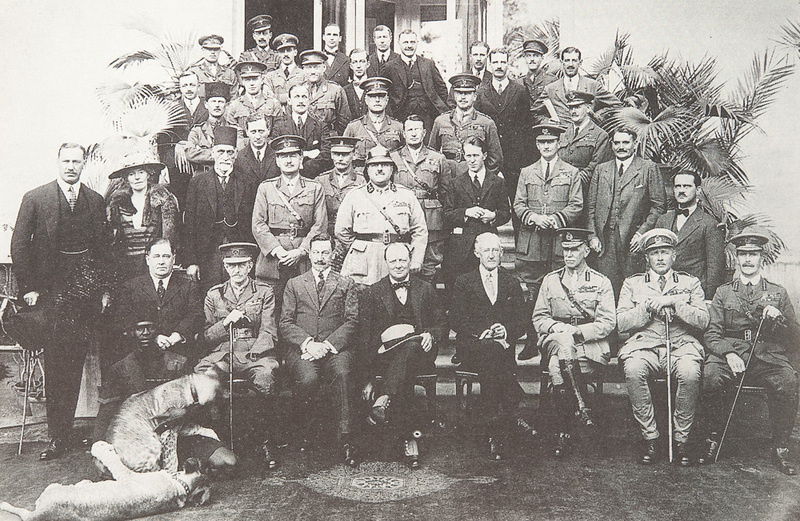 The film did suggest that Lawrence was not initially aware of the Sykes-Picot Agreement when he persuaded the Arabs to revolt which was not true. Lawrence knew right from the very start and had a guilty conscience about it all the way through the revolt. 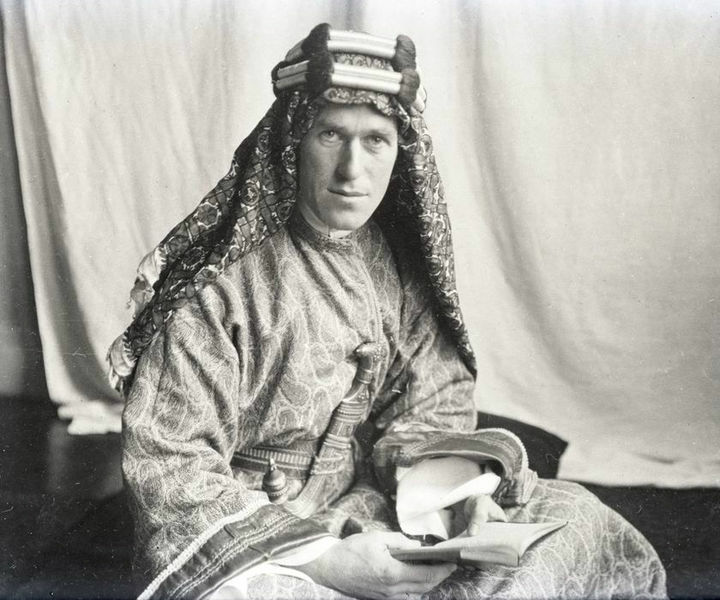 It was one of the reasons he refused a knighthood in October 1918 – he was so disgusted with his government’s intended treatment of the Arabs with false promises (well, who isn’t disgusted with the government some of the time …. most of the time …. but no reason to be silly about it). The film shows a very dramatic charge on Aqaba (Akaba). In fact, the actual battle took place several miles inland at Abu al Lasan, which controlled entry into Aqaba, which, itself, was taken without any trouble. The initial charge on Abu al Lasan was led by the magnificent Auda ibu Tayi. According to his official biographer, Jeremy Wilson, Lawrence missed it all because, in the excitement, he accidentally shot his camel in the head and was thrown to the ground. Careless or what?! Strangely, he didn’t mention this incident in his Pillars of Wisdom book – must have forgotten due to the bump on his head. One of my favourite scenes in the film is when, after Aqaba, Lawrence drags his companion, Daud, into the British HQ and to the bar and orders two large glasses of lemonade to the horror of the barman and all the officers present (click here). Unfortunately, that didn’t happen. 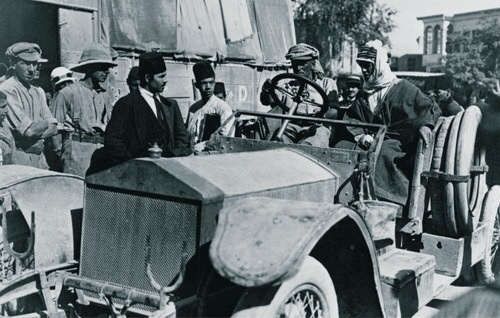 In the first place, Lawrence was with eight Arabs on the journey to report on Aqaba (not just Daud) and at the Suez he sent all of them to Kubri. 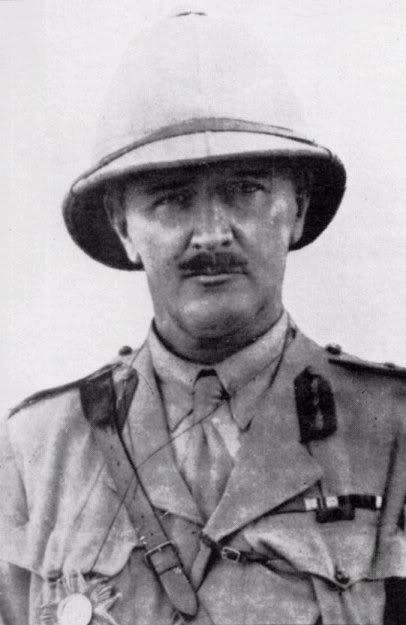 Alone, in a hotel at the Suez he did get a cold drink (six in fact).When he did, finally, meet General Allenby in Cairo, he was, indeed, still in his Arab attire – but only because his replacement British uniform hadn’t arrived in time for the meeting. Also in the film, the guy, Gasim, Lawrence rescued in the desert was not the same guy he executed for shooting a fellow Arab – that was a chap called Hamed – but who cares, I’m just nit-picking. But let’s carry on anyway. His two young companions, Daud and Farras, did exist but were not killed in the way depicted in the film. Daud died of illness, not in quicksand (but mere illness was not dramatic enough for Hollywood), and Farras …. well, okay, he was shot by Lawrence to prevent him being captured and tortured by the Turks, but he had not been wounded by blowing himself up with a detonator, he had charged a group of Turks guarding a bridge and was shot off his horse. I suppose, either way, he was a bit dumb. 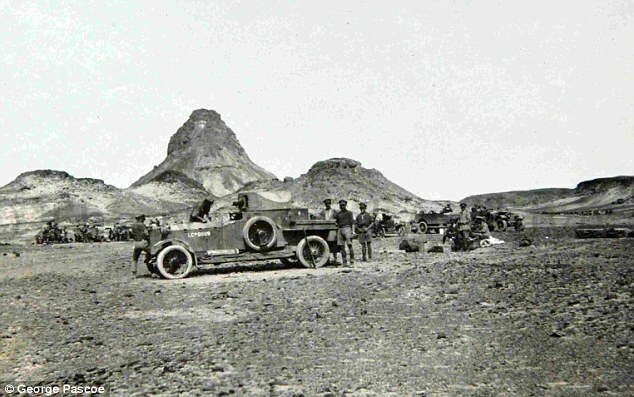 Back to archaeology (and Rolls Royces), John Winterburn, an archaeologist at Bristol University, recently noticed a photo of Lawrence and his Rolls Royce armoured car at a camp in Arabia (pic below) in the National Archives and went in search of the landscape pictured. He eventually found the site and various artefacts. Click here for more details. When Lawrence changed his name to Ross and applied to the RAF, the recruiting officer did not believe him and was convinced he was lying and so sent him away. After awhile, Lawrence, or Ross, came back to the same recruiting officer with an order that he be enlisted with no questions asked (one assumes from someone high up at the Air Ministry)! The recruiting officer obviously realised that this wannabe aircraftman had important contacts, asked no more questions and enlisted him. (Well, he had to pass a medical which caused more complications but we won’t go there). Anyway, the recruiting officer was W.E. 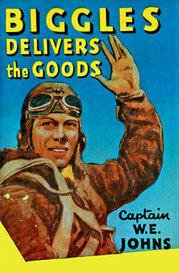 Johns, the writer of the ‘Biggles’ tales. It was as T.E. Shaw that he translated Homer’s Odyssey. Reprints after his death were in Lawrence’s name for obvious reasons – they’d sell better because hardly anyone knew who the heck T.E. Shaw was! Ironically, those editions in Shaw’s sole name are now worth more money. If you are not too keen on the French, you’ll like them even less after this: they were indirectly to blame for all the horrendous casualties at Gallipoli. Lawrence, amongst others, suggested landing the allied troops at Alexandretta, in Syria, which would have been a much safer place. But, if you have been paying attention, you will remember that the very arrogant Sykes-Picon Agreement gave Syria to the French if we won the war. The French did not want British troops in Syria as a result and vetoed the landings there. The Britsh had to look elsewhere and Churchill (then the First Sea Lord) fatally chose Gallipoli (see Scott Anderson interview on this). 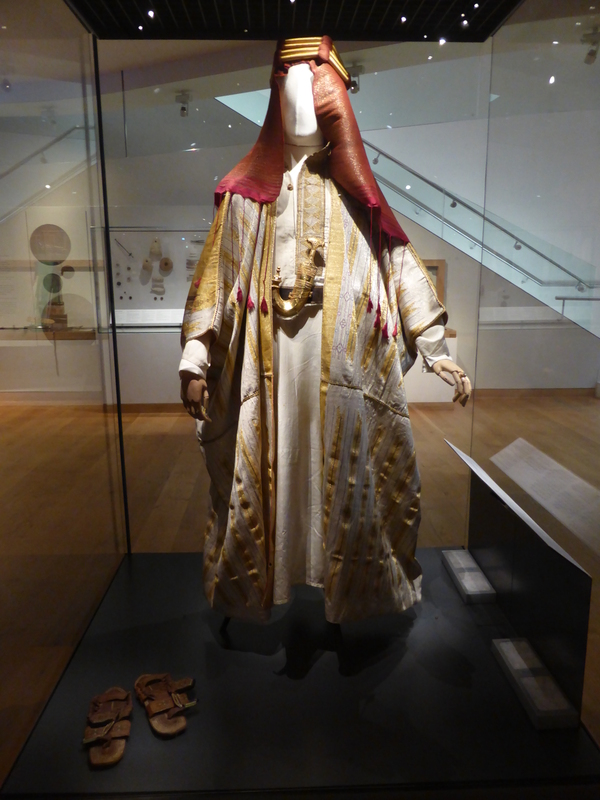 One of Lawrence’s Arabian robes can be seen at the Ashmolean Museum in Oxford. 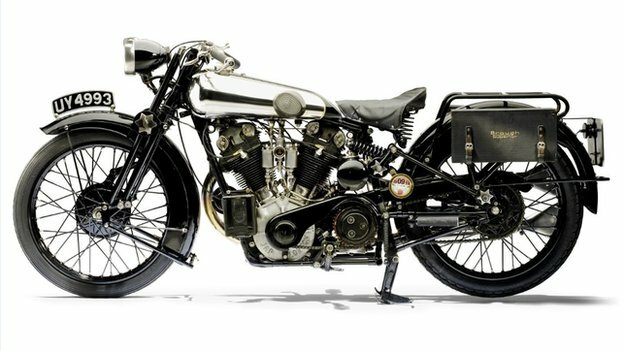 The motorbike on which Lawrence was killed was the Brough Superior SS100s. One came up for auction in London the other day and sold for £315,100. It is the most expensive bike ever sold at auction. Agggggh .. who would be ‘the first up’?? And what about turning in your sleep? I think I would lie motionless …… and awake ….. all night. It’s been dated to the Hellenistic period (post 323 BC) so cannot be the ‘Tomb of Achilles’! Although it has to be a little earlier than Hellenistic if, as alleged, the Persian king, Xerxes, visited it in 480 BC and Alexander the Great visited it (he died in 323 BC). 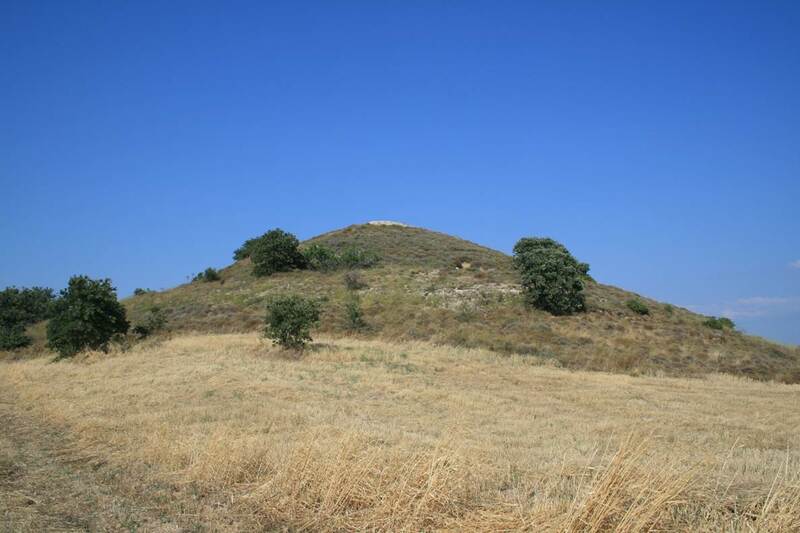 In Bettany Hughes’ book, Helen of Troy (2006, p.176) she visits this mound and says, “Braving vipers and brambles I scrambled to the top …”. My esteemed colleague, Professor Bradley Wunderghast, had been terribly overweight but when I saw him after a leave of absence he had lost several stone. I asked him how he had achieved such success. “Well,” he said, “my doctor told me he wanted me to eat regularly for 2 days, then skip a day, and repeat this procedure for two weeks and I would notice a marked difference. He was right but I nearly dropped dead in the first week. ← The Great Escape: Hollywood fact or fiction? 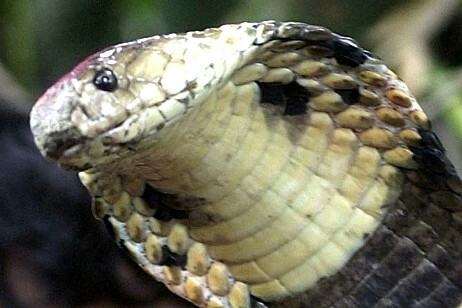 Did I ever tell you my “snake” story?